Shirtless muscular athlete man lifting heavy metal barbell with weight plates standing in sunbeam in gym. Young muscular man in gym lifting heavy barbell on bench, flexing muscles. Muscular shirtless man in gym lifting and working out with weight plate in hands warming up muscles. 4K crop shot of muscular shirtless man in gym lifting and working out with weight plate in hands warming up muscles. 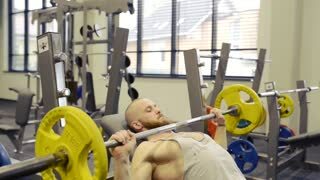 Muscular shirtless athlete with tattooed torso pumping biceps while working out with heavy barbell in gym. Shirtless muscular man lifting and throwing heavy barbell on floor training in gym. Shirtless athletic man with personal trainer lifting heavy barbell doing powerlifting exercise standing in gym.